As a race, the Irish have the reputation of “doing death well”. Taking its cue from this somewhat dubious distinction, this volume explores the relationship of the Irish people with death from the earliest times to the present day. In over seventy articles, it gathers together the expertise of historians, archaeologists, folklorists, sociologists, geographers, Celtic Studies scholars, dramatists, anthropologists, musicologists, theologians, liturgists, undertakers and palliative care specialists, in a wide-ranging and lavishly-illustrated collection, which is, at times, as humorous as it is poignant. Among the topics treated in this anthology is the following: the Galway girl who was buried with her horse in the fifth or sixth century; the account of the curious death of a little-known Irish saint in medieval Norway; the Black Death in Kilkenny; death and sexual transgression in medieval Ireland; grisly deaths from the Irish annals; the funerary monuments of clerical wives in early modern Ireland; the forgotten Connacht massacre of 1647; a seventeenth-century Belfast ghost story; an Irish story of cannibalism on the high seas; the records of an Offaly coroner during the Great Famine; the Derry ghost who imparted information on the missing Franklin expedition in the Arctic in 1849; Jewish burial customs in nineteenth-century Ireland; death and Irish freemasonry; the Irishman whose body was shipped back to Ireland from Italy in an upright piano; death in Irish folklore; the history of children’s burial grounds in Ireland; the ritual of tobacco use at Irish wakes; memorial cards and Irish funerary culture; death in Irish sermons; funeral rites among the Irish Travelling community; death and dying in contemporary Irish pagan belief; the link between commemoration of the dead and humour; deathbed visions; attitudes towards death and dying in modern Ireland, including the impact of social media on the culture of commemorating the dead. This collection will be an indispensable resource for anyone with an interest in the social, cultural and religious history of the Irish. 'A poignant, yet often hilarious salute to what we, the Irish, do best'. Myles Dungan, historian and broadcaster. Professor Patrick Geoghegan, Trinity College Dublin, and presenter of ‘Talking History’ on Newstalk radio. Author of Death and Dying: A Sociological Introduction, Polity Press (2007). 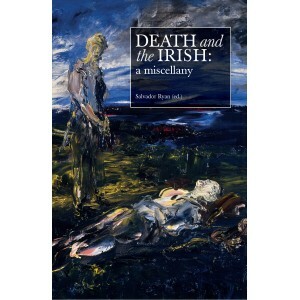 Death and the Irish: A miscellany is commendable for its inclusion of marginalised groups such as Travellers, and for the links made between Irish practices and Jewish and Muslim beliefs. The Irish may not necessarily “do” death better than anyone else, but as this volume makes clear, the history and rituals surrounding death offer a rich and complex area of study, one that has much to tell us about Irish attitudes towards mortality and treatment of the dead. The people of Ireland. as this book attests, "do death well": both the lead-up to it, and the aftermath. In this rich collection of essays, we run the gamut of that entire collective experience, from ancient times to modern practices—many of which, of course, are carrying on time-honoured traditions. The superbly (and appropriately) named editor Salvador Ryan begins with some sweet-natured and warmly witty personal memories of death. His recollection of high-speed rosaries, funeral corteges and endless cups of tea at the removal will strike a familiar chord with everyone who grew up in Ireland in the last 50 years. Then follows a superb collection of 75 pieces, with contributions from undertakers and hospice carers, storytellers and artists, religious Leaders and academics of all stripes. The beauty of a book like this is its huge diversity: there's something of interest here for literally all readers. For myself, and this is solely down to personal taste, your choices will be different, I was most taken with Catherine Swift's piece on ogham stones: Bernadette Williams' chilling (and strangely moving, even at this distance) account of the Black Death laying waste to Kilkenny in 1348; Patricia Lysaght's essay on banshees — is there anything more Irish than that? — and Nollaig Ó Muiraíle's amusingly grisly litany of medieval deaths in battle. I also enjoyed Kevin Myers' piece on the Irish use of humour in treating death, which contains a story about a dying man angrily abusing everyone standing around his bedside - an action which they found hilarious and completely appropriate to the man and the circumstances. An exemplary collection. then, with some lovely pictorial accompaniment and an extensive list of suggested further reading. I'd especially recommend it for anyone interested in history, particularly social/cultural,and the anthropological quirks of the Irish race. ...this is a book that offers a rich and varied menu from which the reader may select at will and find enjoyment. When reading a collection like this there can be a temptation for the reviewer to gravitate towards the entries on the period of their own specialisation and form their judgement based on a narrow band of contributions. It didn’t happen here. That’s because death is a fate that awaits every one of us, so this volume just can’t be cherry-picked. It is impossible not to be interested (even unwillingly) in every facet of demise and its consequences. That gives Death and the Irish a unique feel. Here is an experience so universal that fifth-century inscriptions are as immediate to any reader as the funeral that we find ourselves looking up today on www.rip.ie. There is also an impenetrable quality about death, since any purported information from beyond the grave is both scant and contested. That impenetrability keeps the reader hooked and looking for more. Not many books illuminate something that most of us prefer to keep at arm’s length so well, so quietly and so generously. Even if death scares you beyond all measure, there’s no need to be scared by this book. In fact, the only thing that might really scare you is the degree to which you’ll enjoy it.